Easily choose how spicy you dish is from mild, medium, spicy and hot. If in doubt our staff are always on hand to offer help or advice. (v) = Suitable for vegetarians. PLEASE NOTE: The menu contain allergens, download and view our Allergens Menu. 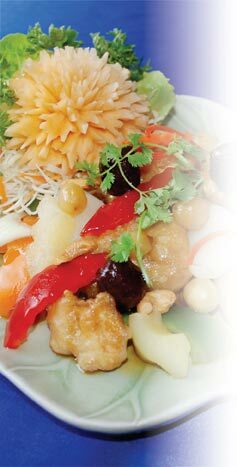 Some of the dishes contain traces of nuts, if you have an allergy to nuts or any other foods please let the staff know so that we can prepare the dish to your requirements. 22. Bangkok Street Platter (for 2 people) (spicy) (g)Pork sausage, chicken wings, fishcakes, BBQ beef and chicken balls served with Thai sauces. 23. Aroi Thai Mixed Platter (for 2 people) (mild)Chicken satay, pork ribs, wrapped King prawns, vegetable spring roll, chicken and prawns sesame toasties served with Thai sauces. 24. Aroi Thai Mixed Vegetable Platter (for 2 people) (mild)Vegetable spring rolls, sweetcorn cakes, mushroom satay, vegetable tempura, deep fried bean curd with Thai sauces. Served with mushrooms and a mixture of iconic Thai herbs and spices simmered in coconut milk. The heat of chilli is nicely mitigated by the cooling coconut milk. Served with mushrooms in a hot soup of galanga, kaffir lime leaves, lemon grass, chilli and a dash of fresh lemon juice. 27. Cucumber Salad (Som Tam) (medium) (v) (n)Juicy flechettes of cucumber and grated carrot with lashings of tangy hot dressing, topped with crunched peanut. 28. Grilled Beef Salad (Yam Nuae Yang) (medium) (g)Sliced beef salad with spring onion, red onion, coriander, chilli and roast brown rice. 29. Stir Fried Rice (Kao Pad) (mild) (g) (v)Stir fried jasmine rice with eggs, onions and tomatoes in soy sauce. 30. Stir Fried Noodles (Pad Thai) (mild) (n) (g) (v)Stir fried with rice noodles, egg, bean sprouts, spring onions and carrots in a tamarind sauce topped with crunched peanuts and lemon coriander. 31. Rice Vermicelli (Pad Mee) (mild) (v)Stir fried with rice vermicelli, egg, broccoli, bean sprouts and spring onions in dark soy sauce. 32. Green Curry (Gaeng Kiew Waan) (medium) (g)The famous fragrant Thai green curry cooked in coconut milk, bamboo shoots, peppers, sliced aubergines, flavoured with Thai herbs and sweet basil. 33. Red Curry (Gaeng Daeng) (medium) (g)Aromatic Thai red curry cooked in coconut milk, bamboo shoots, peppers, sliced aubergines, flavoured with Thai herbs and sweet basil. 34. Yellow Curry (Gaeng Garee) (medium) (n) (g)A delicate yellow curry paste cooked in coconut milk with your choice of meat and diced potatoes, onions, cashew nuts and topped with deep fired onions. 35. Massaman Curry (Gaeng Massaman) (mild) (n) (g)A mild creamy Thai curry dish, made with potatoes and onions simmered in coconut milk with ground peanuts and topped with deep fried onions. Available with lamb £10.00. 36. Jungle Curry (Gaeng Paa) (hot) (g)The ultimate Thai jungle curry with your choice of meats together with bamboo shoots, broccoli, Thai basil, green pepper corns, baby corn and aromatic Thai herbs. 37. Pineapple Curry (Gaeng Kuasabparod) (medium) (g)Traditional style Thai curry with diced pineapples, onions, tomatoes and Thai herbs slowly cooked in coconut milk with your choice of meat. 38. Dry Curry (Panang Curry) (medium) (n) (g)A rich and think sauce red curry in coconut milk, this dish includes fine beans, crushed peanuts and kaffir lime leaves. 39. Chu Chee Curry (Gaeng Chu Chee) (medium) (g)Dry rich curry sauce with peppercorns and basil leaves in coconut milk with kaffir lime leaves. 41. Sweet and Sour Stir Fried (Pad Priew Waan) (mild) (g) (v)Stir fried onions, peppers, tomatoes, cucumber, spring onions and sliced pineapple in sweet and sour sauce. 42. Black Pepper Sauce Stir Fried (Pad Prik Thai Dam) (mild) (g) (v)Stir fried with mixed vegetables and black pepper sauce. 43. Cashew Nut Stir Fried (Pad Med Ma Muang) (mild) (n) (v)Stir fried with cashew nuts, peppers, onions, mushrooms and carrot in our stir fried sauce. 44. Garlic Stir Fried (Pad Gratiem) (mild) (g) (v)Stir fried with chopped garlic, onions, mushrooms, carrots and peppers in soy sauce. 46. Oyster Sauce Stir Fried (Pad Naam Man Hoy) (mild)Stir fried with mushrooms, finely sliced carrot, baby corn, onions and peppers in oyster sauce. 47. Thai Basil Stir Fried (Pad Kra Prao) (very hot) (g) (v)Stir fried with fresh chilli, accompanied with garlic, onions, peppers, bamboo and fine beans topped with crispy holy basil leaves. 48. Chilli Oil Stir Fried (Pad Naam Prik Phao) (medium) (g) (v)Stir fried with spring onions, carrots, mushrooms and peppers in Thai chilli oil sauce. 50. Thai Herbs with Chilli Stir Fried (Pad Chaa) (hot) (g) (v)Stir fried with a combination of sliced tropical crocus root, lemongrass, peppers, bamboo, chilli, kiffir, lime leaves and sweet basil in aromatic sauce. 51. Prawns with Mixed Fruit Stir Fried (Pad Phol La Mai) (mild) (n)Stir fried King prawns with pineapple, spring onions, rambutan, mushrooms, water chestnut, cashew nuts, dates and lotus seeds topped with tamarind sauce. 52. Stir Fried (mild)Choice of meat with peppers, spring onions, and tomatoes in red wine sauce served on a flaming sizzling platter. 53. Chicken Aroi Thai (Gai Aroi Thai) (mild) (n)Sliced chicken, stir fried with pineapple, spring onions, mushrooms, dates, peppers, rambutan, water chestnuts, cashew nuts and lotus seeds topped with tamarind sauce. 54. Duck Aroi Thai (Ped Aroi Thai) (mild) (n)Stir fried sliced duck with pineapple, spring onions, mushrooms, dates, peppers, rambutan, water chestnuts and lotus seeds topped with tamarind sauce. 55. King Prawns Aroi Thai (Gung Aroi Thai) (mild) (n)Lightly battered prawns stir fried pineapple, spring onions, mushrooms, dates, peppers, rambutan, water chestnuts, cashew nuts and lotus seeds topped with tamarind sauce. 56. Duck Tamarind (Ped Makharm) (mild) (g)A sliced breast of Thai roast duck full bodied tamarind sauce with the whole dish served with crispy vermicelli noodles. 57. Half Chicken (Gai Yang) (mild) (g)Half a grilled chicken Thai style marinated for 24 hours with coriander herbs served with sweet chilli sauce. 58. Weeping Tiger (Sua Rong Hai) (mild) (g)Classic Thai grilled and sliced sirloin steak served with hot and tangy chilli dip and drizzled with black pepper sauce. 59. Aromatic Crispy Duck (Ped Krob) (mild)Half or quarter of duck served with pancakes and Thai sauces. 66. Steamed Tilapia (Plaa Nung Manow) (medium) (g)Steamed tilapia with chopped garlic, lime juice, coriander and Thai chillies. 67. Steamed Whole Sea Bass (Plaa Nueng Buay) (mild) (g)Steamed whole sea bass with ginger, Asian mushrooms, spring onions, celery in a plum sauce. 68. Fillet of Fish (Plaa Priew Waan) (mild)Deep-fried fillet of fish in a light batter with fresh vegetables in a sweet and sour sauce. 69. Battered Fish Fillet (Plaa Sam Rot) (medium)Deep fried lightly battered fillet of fish with chopped peppers and onions topped with three flavour sauce. 70. Deep Fried Whole Sea Bass (Plaa Aroi Thai Lui Suan) (medium)Deep fried whole sea bass served with fresh vegetables and Aroi Thai style fish sauce with garlic, chilli, lime juice and topped with crushed peanut.